I often walk the Lake Alma Trail before daylight. On a recent morning I was listening to my iPod while focusing on my footing made visible with a headlamp. “Sure on This Shinning Night,” a choral piece by Morten Lauridsen , was playing as my focus narrowed down the trail. Suddenly I paused to let the music sweep over me. 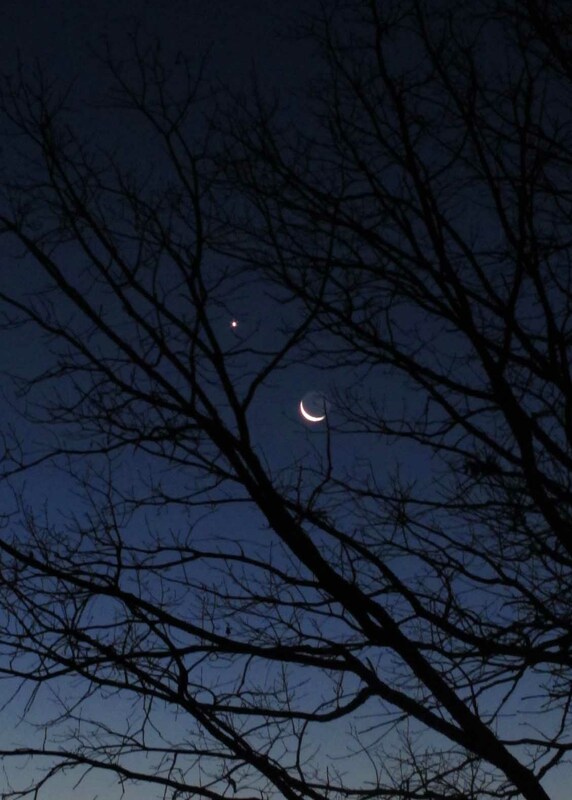 I looked toward the sky through oak limb silhouettes to a silvery new moon. It was a worshipful few moments for me as the beautiful sound accompanied the shining moon and stars. I felt intense thankfulness. Thankful for my senses, especially hearing and sight. Thankful for the burn in my legs and steady pounding in my chest. Thankful for the gift of another day! I look forward to these early morning hikes and am thankful for the beautiful places of worship to be found in nature. This entry was tagged Craig Hella Johnson, Lake Alma Trail, Sure on This Shinning Night, thankful, worship. Bookmark the permalink.